KIRE :: ZNC IRC bouncers allow you to proxy through our servers to mask your host on IRC for added security. KIRE : linux shell accounts, irc eggdrop bots, znc bouncers, ircd hosting, much more. KIRE IRC bouncer accounts are the perfect way to maintain privacy and persistent connections on IRC. 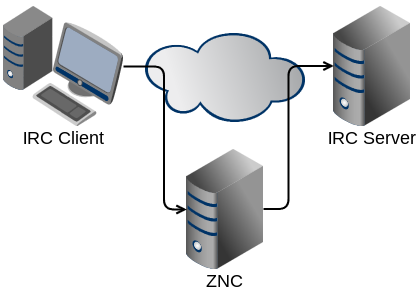 A bouncer (also known as a psyBNC or ZNC) is an application that runs 24 hours a day on our high availability servers. It accepts incoming connections from your normal IRC client, acting an encrypted proxy between your computer and any IRC server while masking your real hostname and staying connected even when you are not. Every KIRE BNC account has access to bind to any one of over 100 different hostnames. These vanity hosts can be used as your connecting hostname while on IRC, masking your own personal IP address. In addition to your IRC bouncer, your account comes with a fully functional and SPAM protected @kire.net e-mail address accessible by POP3, IMAP, or Webmail anywhere in the world.